My humble apologies to Bud Abbott and Lou Costello, who made this scene unforgettable. 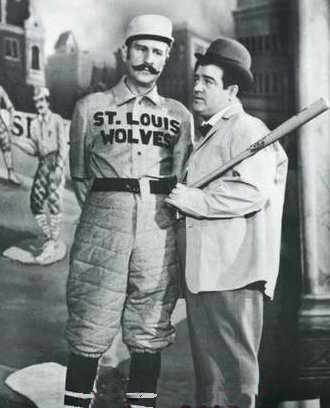 Once the idea for this story found its way into my head, I could not let it go………..
Two seemingly intelligent men enter the infield of a baseball field; one is the coach of the team that will play later that day, and the other a reporter for a local newspaper. Neither person graduated at the top of their class. Sitting in chairs with the pitcher’s mound as a backdrop, the reporter begins his pregame interview with the coach. “Great day for a baseball game,” stated the reporter. “Every day is a great day for a baseball game,” corrected the coach. “They will win, I guarantee it,” boldly pronounced the coach. “Because mine is the best team.” No brag, just fact. The coach stood, and looking up at the sky began to slowly walk away from the reporter. “Where you going, we are not done yet?” The reporter was concerned. Loud thunder rolled across the sky (very good timing). The reporter looked to the sky, “OK, I’m sorry. I didn’t mean to insult anybody. Come on coach, let’s finish.” The coach sat down. “One more question. When your team is up to bat, if God bats first, and he is the only one on the team, who bats second?” A good question. When it is time to choose players for your team, pick the best player first. This entry was posted in Talking to God by Michael Obermire. Bookmark the permalink. Im impressed, I ought to say. Incredibly hardly ever do I come across a blog thats each informative and entertaining, and let me let you know, youve hit the nail on the head. Your weblog is crucial; the issue is some thing that not sufficient individuals are talking intelligently about. Im really pleased that I stumbled across this in my search for some thing relating to this problem. Highly rated post. I learn something completely new on completely different blogs everyday. Deciding on one . stimulating to learn the paper content from other writers and be taught a bit one thing from their website. I’d like to use certain of this content on my weblog you’re mind. Natually I’ll give a link here we are at your internet-site. Admire your sharing. First time visitor to your blog here. Interesting stuff…thanks for sharing! Nice blog, have you been running it long? Not long, about six months.